I hope you had a nice Thanksgiving weekend. I didn't do that much Black Friday/Cyber Monday shopping, but one of the things I did do was finally place an order with the brand Grana. I have been hearing about them a lot (I just randomly listened to their founder on a podcast) and they had a 50% off flash sale, so I rolled the dice and ordered a few items. 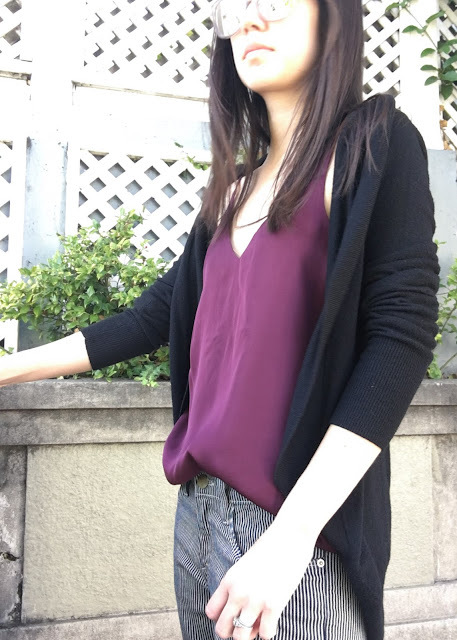 I'll do a more in-depth review of what I purchased in short order, but for now, here is a sneak peak at their Silk V-Neck Camisole, which I can already tell I am going to wear all the time. 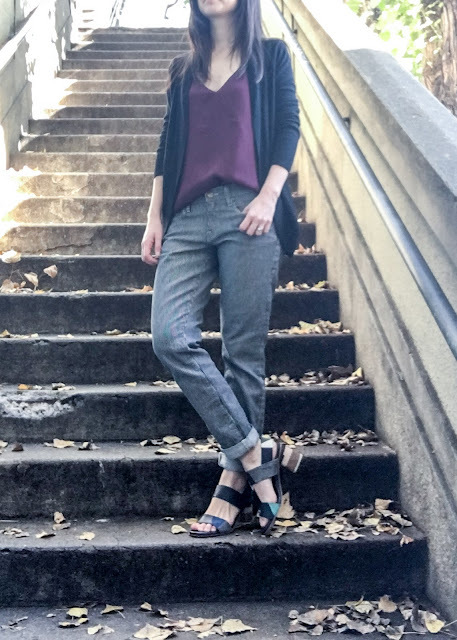 It is always a bit of a challenge to figure out what to wear with these train-conductor-striped boyfriends jeans but this deep maroon color was perfect. I also decided to live a little and switched up my shoes, opting to lean into the stripe in my jeans with a stripe in my shoes (ok, it is more of a color-block than a stripe, but verticality is involved). I was running errands, which entailed walking up a few steep hills and made me think sneakers would have been the more practical choice, but you know what, I was darn excited about the outfit. I agree! I went back to get this tank in another color and it was sold out in my size.